12723 N. 132nd E. Ave.
A memorial plaque was presented to the school in honor of George M. Floyd. George Floyd was a graduate of the class of 1944. He died in Oct. 2000 and his daughter and son in law John and Diann Boehm have been giving a scholarship and trees to the school ever since. CHS Baseball Coach Tony Reeder was honored (Jan. 9th, 2007) along with past teachers, and future teachers Of Collinsville High School for their work and dedication to the students and town of Collinsville. Diann is an educator and has traveled all over the world. She says outside of her brothers who also coach that she has never seen such a hard working dedicated coach. My dad would have enjoyed knowing him. Collinsville, Oklahoma's ballpark is something to be proud of. That says a lot from a Texas girl where sports and Texas are one and the same. 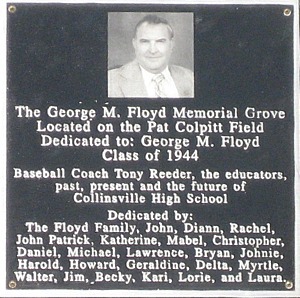 George Floyd would be proud to be honored at his high school. He is a WWII vet, a father of six and has twelve grand children and two great grand children. Though he moved to Texas there is still no place like home. 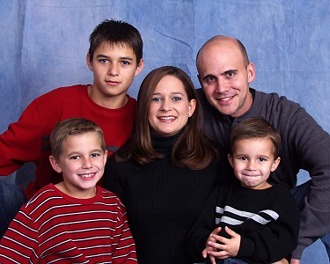 He has fond memories of his friends and family of Collinsville and Owasso Oklahoma. 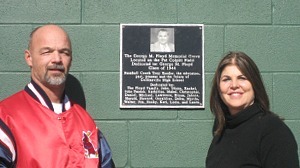 Coach Tony Reeder and Diann Boehm at the Jan. 9th, 2007 plaque presentation at the Collinsville High School baseball field (Pat Colpitt Field).